It is by far mankind's most extensive construction endeavor. In its heyday in the 16th and 17th centuries, it snaked 6400 kilometers or 4000 miles across northern China (see map). This is by far the most popular Great Wall of China site for travelers, mainly because it is close to Beijing (less than two hours away) and is much easier to climb than the other Great Wall sections. The Badaling section was built around 500 years ago - and was extensively renovated by the present Chinese government over the last several decades. Be mindful that Badaling swarms with tour groups, individual tourists and hawkers - and has become somewhat tacky. This could taint your photographs and memories of an otherwise visually striking Great Wall of China site. It is an hour farther away from Beijing than Badaling. This is a blessing - the extra travel time means that fewer vacation tour groups will travel to it. This Great Wall of China site is remarkable. 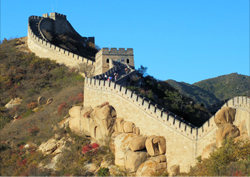 The incline of the wall at Mutianya is noticeably steeper than Badaling's. However, like Badaling, Mutianya has a cable car for tourists who choose not to walk up the wall. You must travel yet another hour to reach the Simatai site from Beijing and, therefore, you will encounter even fewer vacationers than at Mutianya. Some of the wall dramatically clings to precipitous mountain ridges. Because the incline is especially steep and there is no cable car, I do not recommend the Great Wall of China site at Simatai for those not in good physical condition. This is the closest section to Beijing. The Shixiaguan section is currently being reconstructed but is open to the public. You can view it from your vehicle as you drive to the Badaling section (see above). Or, you can stop and climb it. However, be aware that the Shixiaguan wall ascends a long, very steep slope.